Well, I still can’t believe the weekend is over. It was a good one as they always are. Saturday was spent celebrating Kari and Tony’s wedding and relaxing in the evening. We slept in until 8:30 which felt amazing. It was so nice to have a relaxing morning and not have to rush to get up, or set the alarm. Once I rolled out of bed, I got to work on a fruit smoothie. I also had a cup of hazelnut coffee. 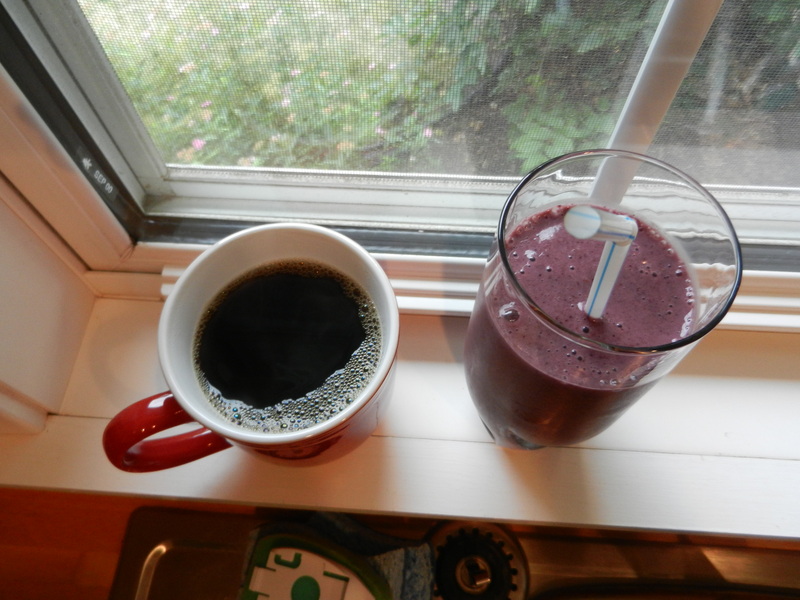 I drank my liquid breakfast while flipping through the Sunday paper and cutting coupons. After a leisurely morning, we got out and ran our standard Sunday errands. We made a trip to the co-op for freshly ground peanut butter (we priced it out and it was cheaper to buy it this way than make our own), then we went to Target, and lastly Costco. By the time we got home at 12:30 I was about to eat my hair. Our fridge was fully stocked. I whipped up a batch of scrambled eggs seasoned with salt and pepper. I wanted to try incorporating some Dry Curd Cottage Cheese (SCD talks about this stuff all the time). It took me 2 weeks to find this cheese–I thought I had the right kind during the intro diet, but turns out I bought the wrong stuff. Anyway, I mixed in a spoonful of DCCC into the eggs with high hopes of a cheesy nummy egg, but it turned out to be a flop. 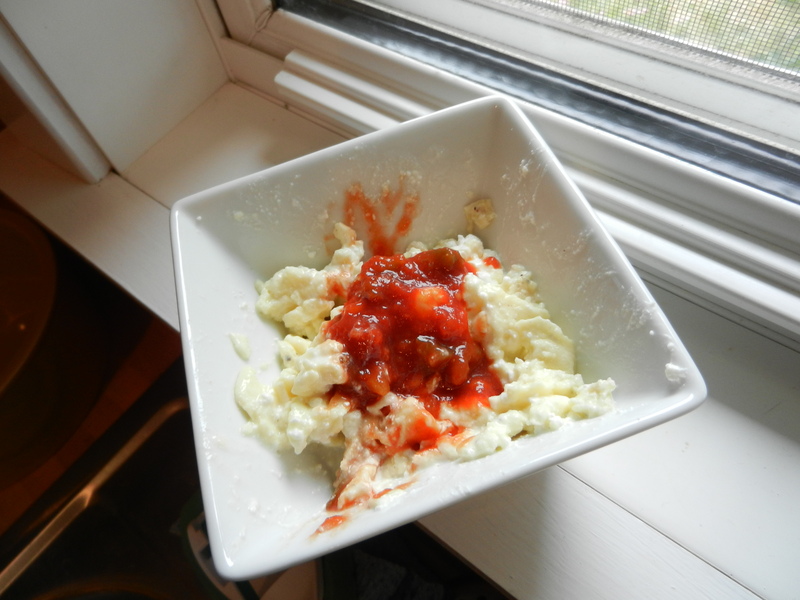 It tasted like cottage cheese mixed with eggs (duh) and I should have known that it would come out that way. I guess I thought the cheese would sort of melt into the eggs a little better. The texture was a little too funky for me. I topped it with salsa which made it taste a little better, and I choked down a couple of bites before moving on to something else. After my failed DCCC eggs, I went on to eat cooked carrots, watermelon, and almond butter. Then, I hit the road to go meet mom for a hot and humid walk. We walked around mom and dad’s neighborhood for about a half hour and we looked like wet noodles by the time we got back because of the humidity. It was a great walk though! After the walk I hung out with mom, dad, and Abbie before coming home to get to work in the kitchen. I think Sunday can officially be deemed food prep day. Lately, it has been working out well to spend a few hours on Sundays preparing food for the SCD so that I am able to continue to stay on track throughout the week. It can be slightly exhausting but it’s always worth it in the end. 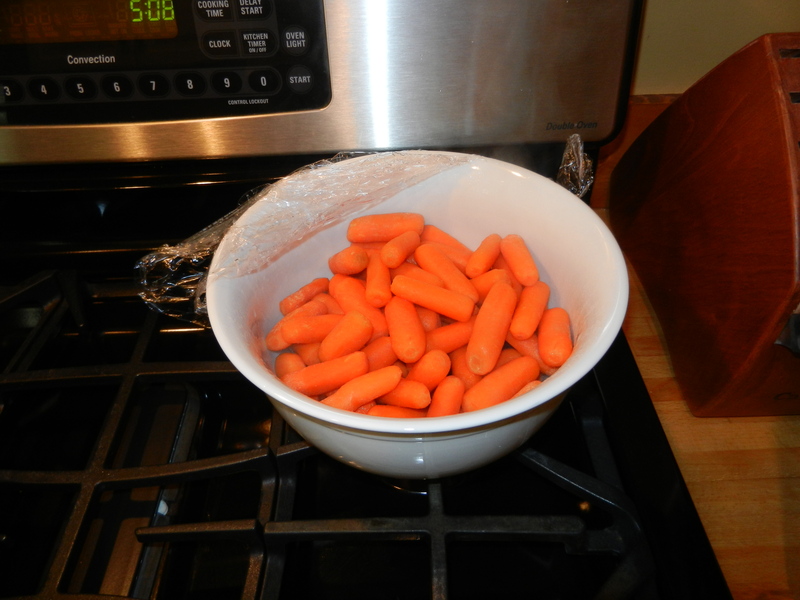 Cooked carrots: place organic baby carrots in a large bowl with about a cup of water, cover and microwave for 8-10 minutes or until carrots are fork tender. I have been eating these like crazy and wanted to have plenty for the week ahead. 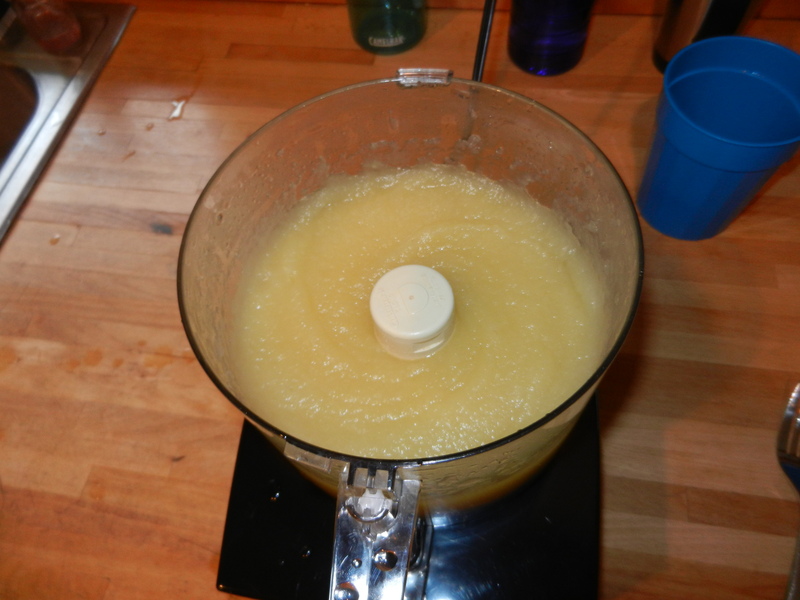 Applesauce: Peel, core, and slice your apples. Place in pot with an inch or two of water in bottom of pot. 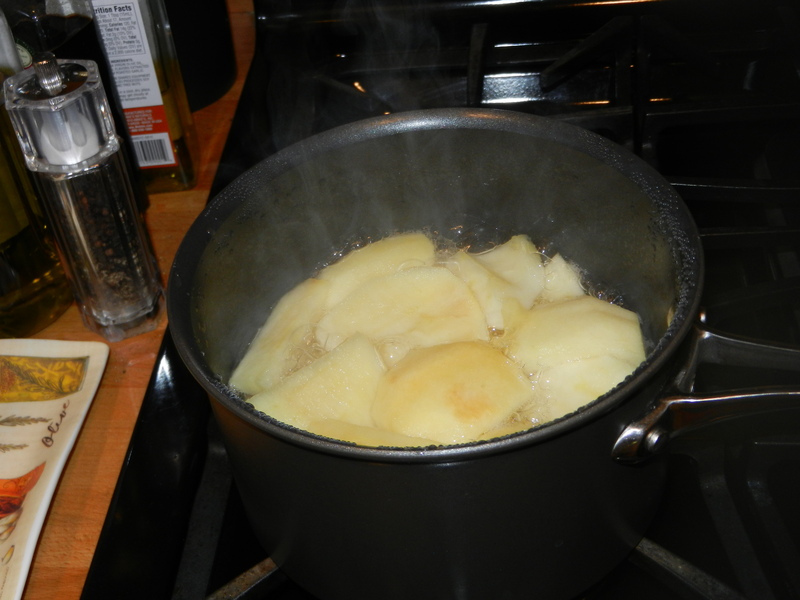 Bring to a boil and let boil for about 10 minutes or until apples are fork tender. 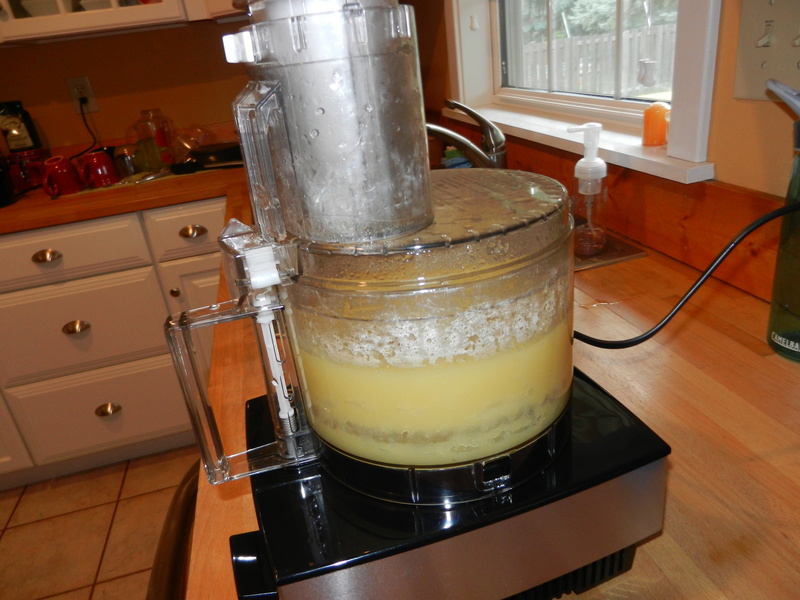 Let the apples cool slightly, then transfer the apples (not the water) to a food processor or blender and blend until smooth. Refrigerate and enjoy plain or with cinnamon. That’s what you call all natural applesauce! 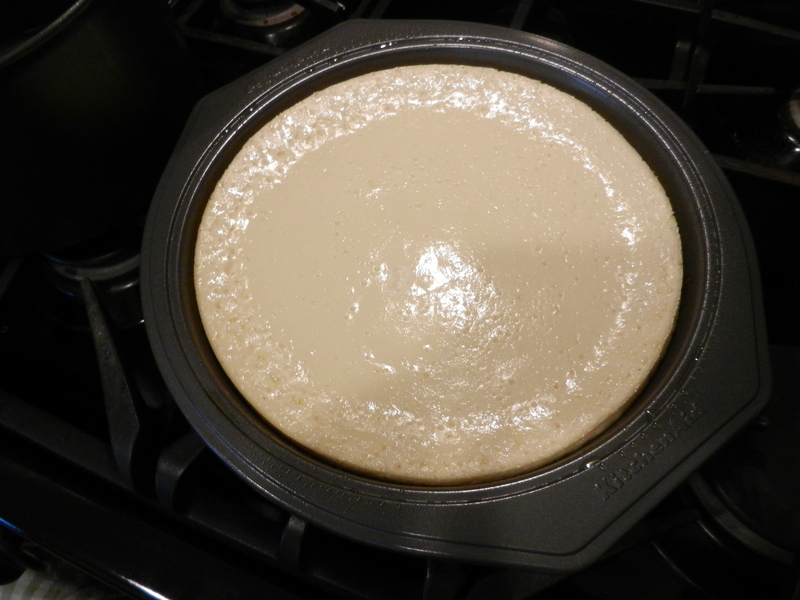 Next up was SCD cheesecake and I used this cheesecake recipe right from the book. Crock pot chicken: I placed two boneless skinless chicken breasts into the crock pot with ground mustard, salt, pepper, and a touch of honey. I set the crock to low and let it go for 4-5 hours. 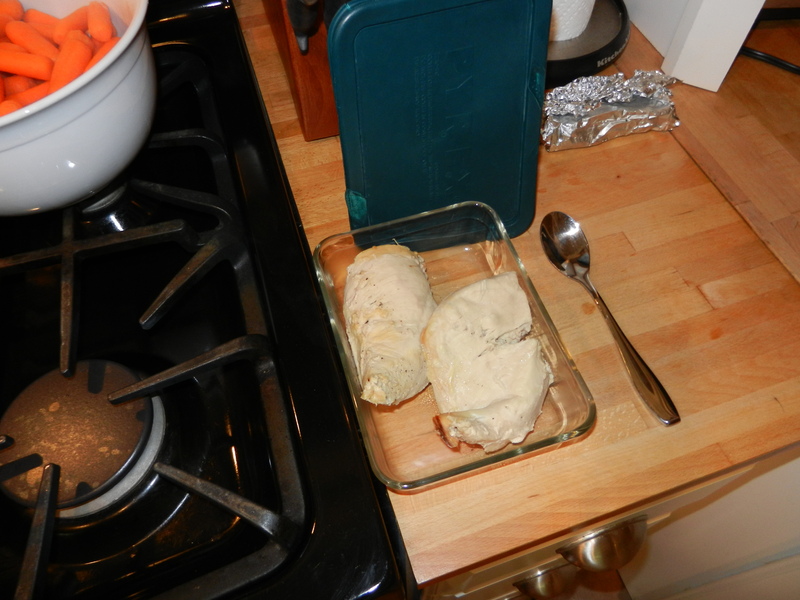 Once the time was up, I removed the chicken and placed into my Pyrex so that it would be ready to eat for lunch or dinner this week. 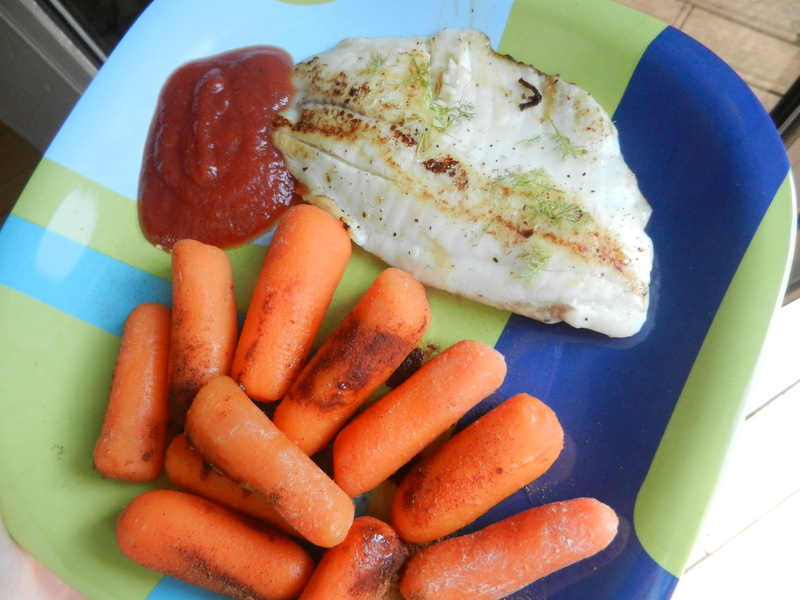 For dinner, we cooked up tilapia seasoned with fresh dill from our garden, fresh lemon juice, and pepper. 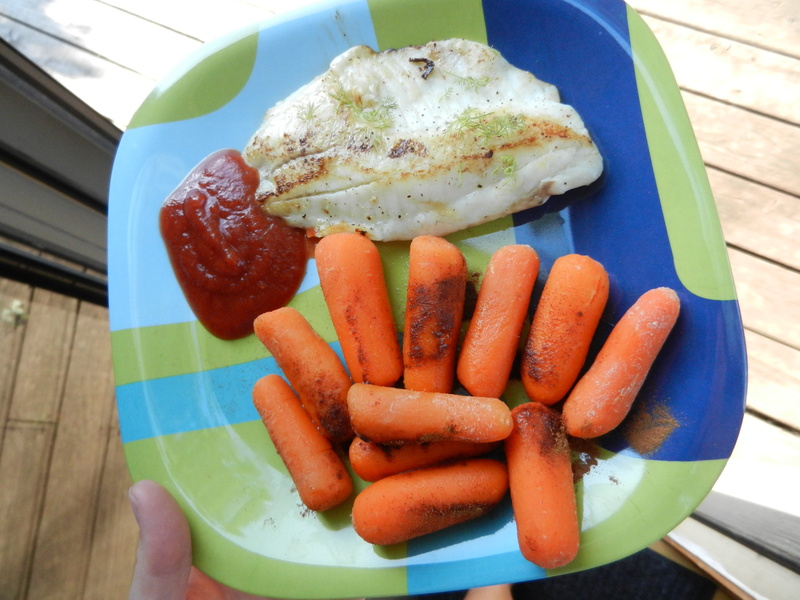 I ate mine with ketchup (obviously), and I had a side of cooked carrots with a sprinkle of cinnamon and honey. I LOVED the carrots with the cinnamon and honey holy cow. They tasted like a dessert to me! I finished the meal off with a piece of cheesecake pictured above. Hmm…well, it tasted better than the last time I made it but that’s because I had used the completely wrong cheese! The taste was alright, but I had a hard time getting past the texture. It wasn’t smooth like I was hoping. Oh well, I can’t say I didn’t try, but probably won’t be attempting to make that again. There you have it; my busy day in the kitchen. The next couple of days I am going to be cooling it with introducing new foods into my diet. My body has been a little off lately and I this past weekend I wasn’t feeling too well. I plan to eat a modified version of the intro diet for a couple of days to get me back on track. Basically, I’m just adding applesauce and bananas on to the intro diet. Since I have already improved tremendously, I know I will be able to handle both of those foods just fine yet still give my system a bit of a break. This will only be for 1 or 2 days, then I should be able to move on again with adding foods back in slowly. That’s the plan as of now. Once I was all done with the food prep, the rest of my Sunday night was spent watching the Season Finale of The Bachelorette. I am pretty surprised with the outcome. Have a great day everybody! I’ll catch up with you soon. This entry was posted in Breakfast, Dinners, Family, Health, Sweet Treats and tagged crockpot, Eggs, SCD, sweet treats, U.C., Veggies, Yogurt by Melanie. Bookmark the permalink. You may be feeling a bit off because of all the raw fruit (except applesauce and banana) and peanut and nut butters you’re eating. Be very careful with both of those because they’re both hard to digest. I didn’t even eat any raw fruit until maybe 5 months into the diet. Prior, I cooked it if I wanted to eat it and peeled everything that was peel-able. I tried eating some raw fruit early on, about a month into the diet, and experienced terrible consequences because of it. Same thing with almond flour happened with me, so I waited at least a month before trying it and waited even longer before adding in almond butter. I first introduced pecan butter as a nut butter after two months or so, but didn’t overdo it. I chose pecan based on the scdlifestyle phases chart (I sent this to you, right?). Anyway, it sounds like going back to the intro diet for a bit will be helpful for you. Keep up the good work! Yup you sent me those charts. I think what I am having the hardest time with is the fact that I really don’t enjoy meat too much. Any thoughts in how I can continue to get the protein I need? What would a typical day look like for you during the first month of scd? The first month was really tough for me because I was still a vegetarian (I started eating chicken and turkey in my second month of the SCD). For breakfast the first month, I often ate DCCC mixed with mashed banana, scd yogurt, cinnamon and a drizzle of honey or a pancake of 2 eggs, mashed banana and cinnamon, topped with yogurt and honey. Lunches were often some sort of soup that I’d make over the weekend. I’d often make a version of chicken soup minus the chicken and then I’d cook a couple eggs, cut them in strips and add them to the soup. With this, I’d also have a small dish of DCCC mixed with yogurt, homemade applesauce and some grape juice gelatin, and maybe some avocado. It was the midst of fall when I started the scd, so for dinners the first month, I ate a lot of winter squash mash (acorn, delicata or butternut), baked fish, and peas or zucchini. If it wasn’t fish for my protein, it was eggs. Sometimes, I’d even have a little yogurt and honey after dinner (as my dessert) for some additional protein and calories. The first month was really hard for me to get enough protein and calories, especially because I’m active. That’s why I added some meat into my diet the second month, after not eating it for almost 10 years! The second month I ate a lot of chicken soup, yogurt/banana/DCCC, egg/banana pancakes, cooked squashes, cooked peas, green beans, carrots and zucchini, cooked apples and pears, avocado, hard-boiled eggs, baked chicken breast, and canned tuna. I kept a thorough food diary for the first month, listing my meals, how I felt, and if I had any symptoms (bloating, etc. ), especially after trying a new food. I even listed any unusual bowel movements, etc. (I told you it was thorough!). I did my best not to introduce more than one new food at a time, so it’d be easier to pinpoint the culprit. I often took a digestive enzyme when trying new foods too. The food diary was very helpful. Wow thank you for all of that info! I guess I need to give the DCCC another chance. I made it into an SCD cheesecake and I just wasn’t liking the texture of it at all. Maybe if I mix it with yogurt, bananas, honey, cinnamon, I might like it? That’s a good idea to make a big batch of soup on the weekend. I tried the chicken carrot soup from the book and was not a fan of it at all, but I could work on developing a recipe that I like. Thanks again for all of your help through this. Glad you found it helpful! I’m always happy to share my experience. Yes, hopefully you’ll like the DCCC in the way I suggested, so long as you’re okay with the texture. By adding the yogurt, the texture becomes more like creamed cottage cheese, and the banana, honey and cinnamon make it special. Applesauce is good in there too. You can’t go wrong with soup … just throw whatever you like into the pot and of course, there’s a lot of great recipes out there too. The crock pot comes in very handy as well. I love shredded meat, so will sometimes throw in chicken, veggies, some seasoning and a little broth for moisture and let it cook for several hours. Then I shred the chicken once it’s done, and it literally just falls apart to the touch. Ta da, you have yourself a nice stew!